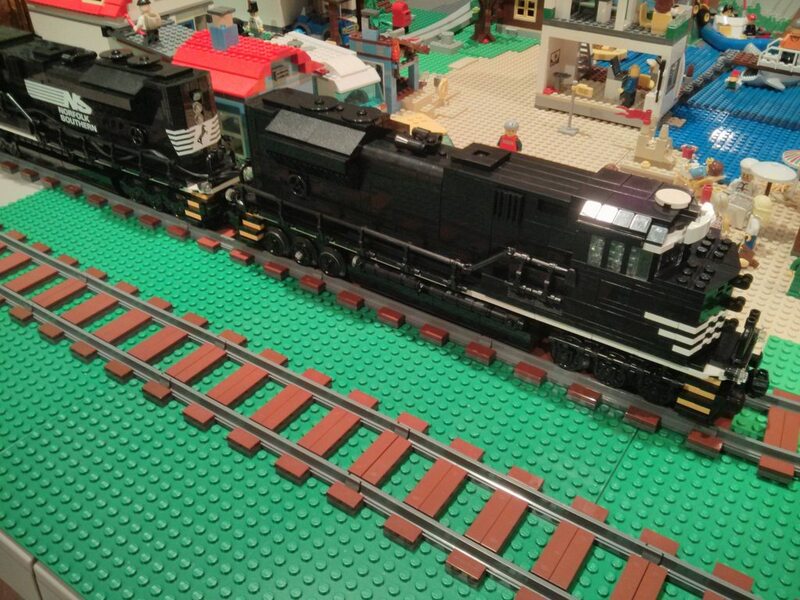 MOC: Norfolk Southern EMD SD70M-2 - Now with 400% more power! When the PF Large motor became available on shop@home, I knew it'd be perfect for my new build; a second Norfolk Southern EMD SD70M-2 to compliment my first. But this time I wanted it to be powered. The external of each is as identical as possible. There are a few differences due to the necessity of covering the sides of the motors with snot and making the thing strong enough that 4 L motors didn't tear it apart. 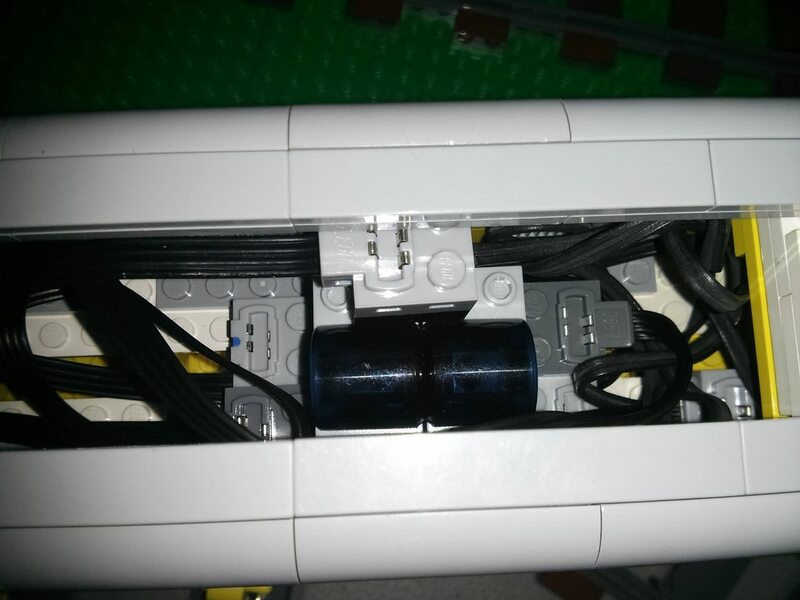 The 4 motors are all connected together. 2 of them spin the opposite direction of the other 2. I completely rebuilt this part of the locomotive 4-5 times, each time making it stronger. The version in this photo is actually 1 version behind what's actually in the final product (but I forgot to take a photo). The sides of the loco are all 1x2x2 and 1x4x3 panels to allow the wires from the motor bottoms to all go above. The motor bases are 4 wide whereas the tops are 3 and the middles are sloped from 3 to 4. Very tricky to cover. 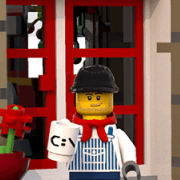 I used http://www.bricklink.com/catalogItem.asp?P=30413 snotted on "Hinge Plate 1 x 6 with 2 and 3 Fingers On Ends" to cover the transition. The only problem I have is that it uses so much power! For the longest time I thought the L motors were awful, but it turns out that a single 9V train regulator wasn't enough to feed all 4. 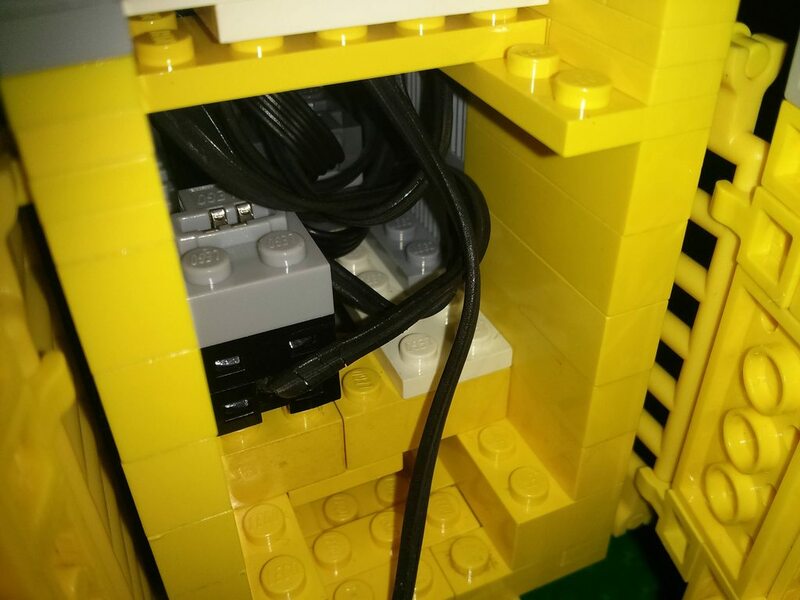 I connected another one in parallel and now it can pull my long, heavy rolling stock through switches and 180 degree curves without slowing down. I can't use a single IR receiver either; it can't provide the needed current and my rechargeable batteries in my battery boxes are 1.2V each rather than 1.5. Luckily, my LUG uses old 9V train motors with the motors removed to pick up 9-12V from the rails to power the motors directly (or power an IR receiver). Unfortunately, this means I can't really use it at home, because all of my track is plastic. very impressive! does it give enough traction too?! Very nice! What are you using for the white-on-black decals? Great work, especially getting it to look identical to your unpowered version! There's a lot of power packed in there. Have you taken it to its limit to see how much it can pull? Any chance we'll see a video of it running? Plenty of traction, haven't had it slip yet. I did have to remove the stock rubber bands from the middle unpowered wheels on each bogie. On uneven track sections, they take most of the weight of the train and would make the wheels slip. The decals are O scale trains bought from eBay. Thanks every one! I'll put a video up when I get back from traveling. On uneven track sections, they take most of the weight of the train and would make the wheels slip. 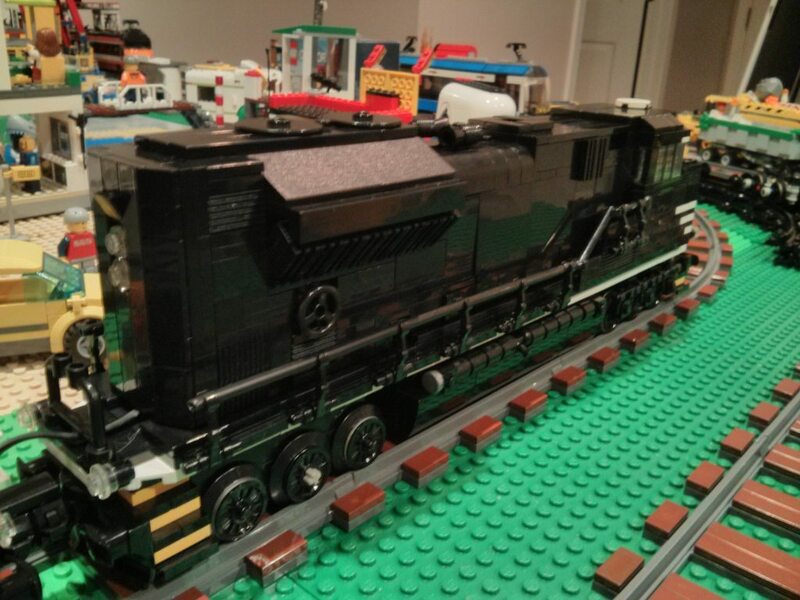 Wow, that's an impressive prime mover, and combined with a great MOC this is a great locomotive. The video answered my question about the wire to the second unit, visible in the last photo... you are literally running on an extension cord (very industrious). Thanks! I ran it on battery this evening. I filled one of my autoracks with 2 AA battery boxes and 2 IR receivers in parallel. Runs good, just not as fast as with the 9V regulator because my 6 rechargeables are 7.2V instead of 9. If I remember, I'll bring home some sandpaper tomorrow and fix my gearboxes so they don't drag on the switches. Then it'll actually make it around my loop without help. Really amazing, I'm impressed with the amount of engineering. Those L motors put out a bit of torque don't they? Any issues with the gear teeth slipping when you're runnig her at max? Thanks! Lots of torque in a fairly small package. Re gear slippage, not since I redesigned the transmission the last time. It used to push itself apart. The only time I've had trouble since is when I crashed the train. The motors were still on but the wheels weren't able to spin. Rather than stall, they pushed the whole gear assembly out of place. Looks great ! Could you show us how you wire 2 batteries a 2 pf recievers together? No problem! 2 AA battery boxes. Each powers a single IR receiver. The IR receivers are on the same channel and their outputs are tied together to a single 9V extension cable that powers all 4 L motors. Yeah I would think so. Possibly more than you need? Lego is fairly light after all. Maybe see what sort of incline you could get it running up? My experiences with powered trains has been with stock Lego locos, but I'm keen to start exploring with the lego motors and gearing. I powered the Maersk train with a regular PF train motor and cheap AAAs. With 7 of the Maersk flatbed cars I sometimes load soft drink cans and it can get it rolling with minimal slip so long as the batteries are fresh. I wonder how heavy a load you could get your going. What's the gear reduction like? Wow! Yet more insanity (I say with the utmost respect and perhaps a little awe). That is a clever trick to wire the IR outputs together (if the receivers complain too much they are replaceable). It is just too bad that you cannot get the weight of the batteries on the drive wheels. We have a Maersk train we use on our Lug displays. 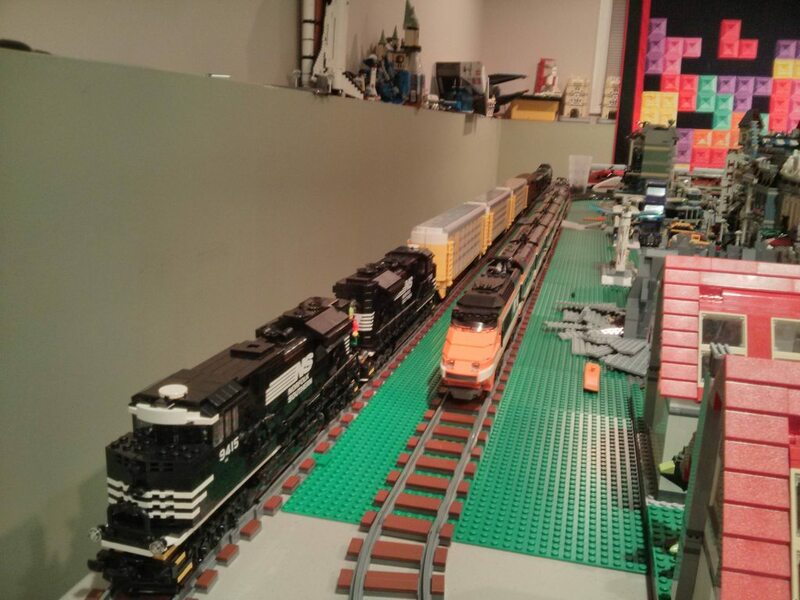 It has 6 stock Lego flatbed cars being pulled by 2 locomotives with 3 pf train motors total. 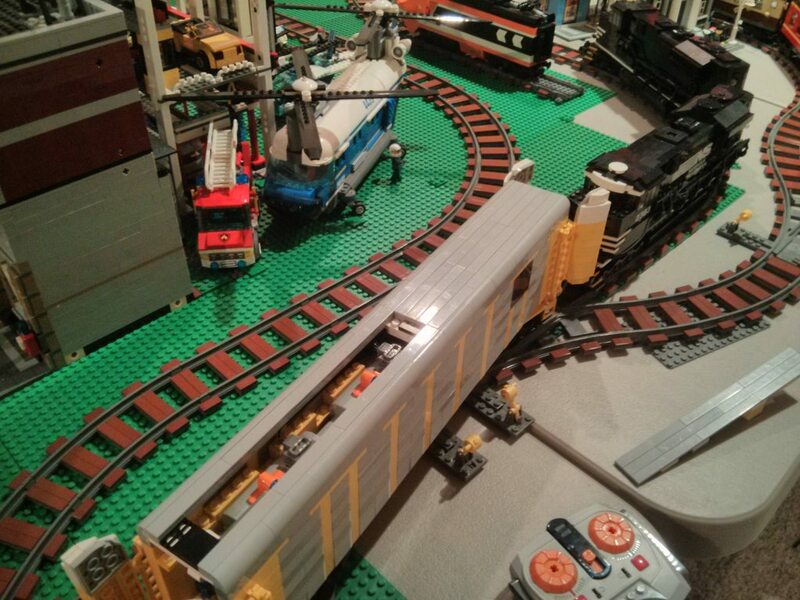 Those flatbeds have so much drag around curves that the train almost slows down to a stop. 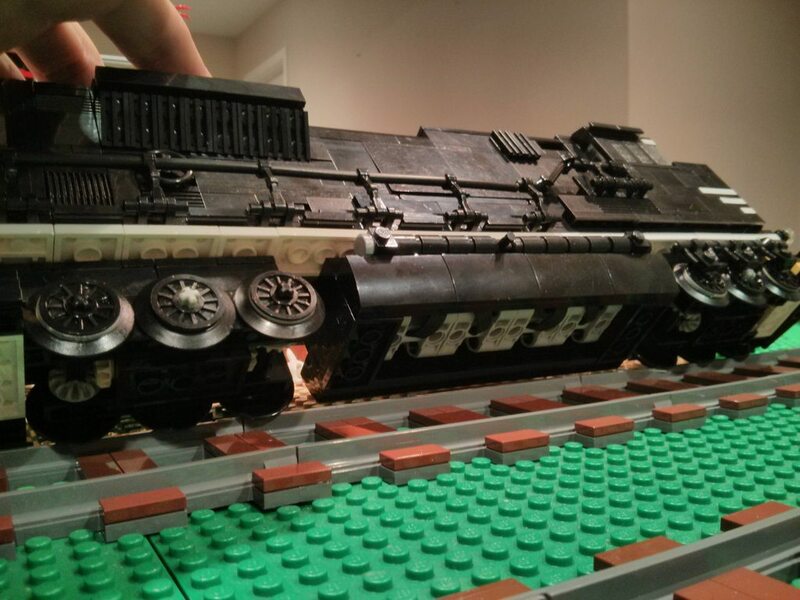 So I designed this locomotive with the goal of being able to power through anything. 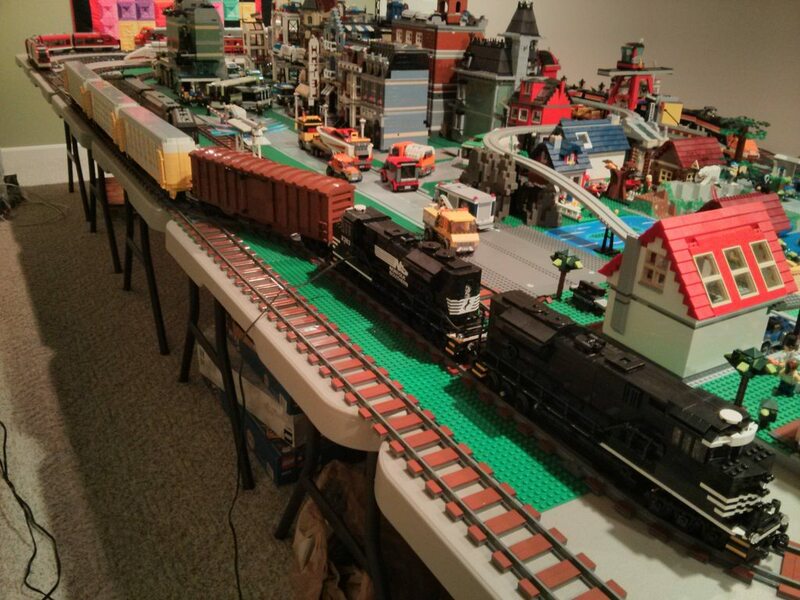 At the moment there are 2 locomotives, 3 autoracks, 2 coal hoppers and a boxcar. 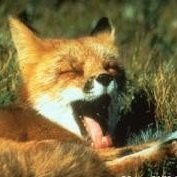 I just ordered the parts to build a couple tank cars. I'd also like to make a few flatbeds. I'll keep adding cars until either the train runs into itself or it can no longer take the turns. I just bought a technic motor set to try and power a boogie. If you succeed in making it work with four motors, I, as a total technic noob should be able to do it with one. Great. First give it a try and come back to these topics to see how I can improve. Thanks for posting ! If you put a couple of gears on the dummy bogie on the Horizon Express and use a technic axle for the pivot instead of the bogie plate, you'll be half way there already. I seemed to have missed this one. Wow, that is a lot of power and a lot of motors! Nice to see it running as well and I like the layout. Decals all applied! I added 2 20W buck boost converters in between the AA battery packs and the IR receivers to bump the voltage from 7.2 to 10. They work great, so great that I started tripping the resettable fuses in the battery boxes. I had to bypass them with wire. The train flies now! It's also longer than the photo shows, there are 3 auto racks, 2 ttx double stack cars, 2 box cars, 2 coal hoppers, and 1 tank car. All 7W and about 16 feet long in total. 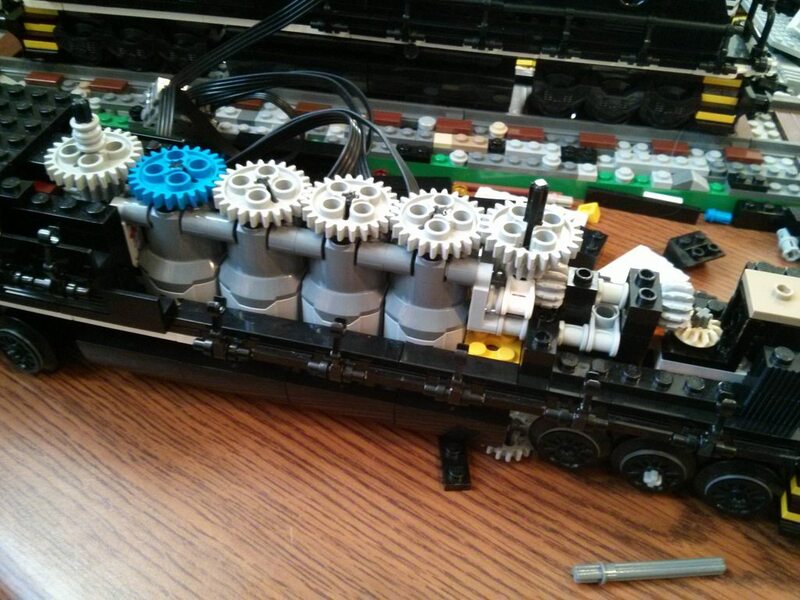 The added voltage also increases the torque and the front half of the locomotive will occasionally push itself apart. Another redesign might be in order... The rear transmission has no problem, as it is designed differently. I'll try to get some more pictures. Wow, that is an absolute monster. The striping on the front, the colors, and the decals are all great, but it's the insides that are the real star of this show.